A family run business started from lifelong love of boating. Started by Willis and Tim Mahaney after going to Ohio to the Custom Marine Canvas Training Workshop in April of 1997. After our professional training we started working out of Willis' dining room with one machine and tools we bought from the school. We went to Beacon Bay Marina looking for wood to make a sewing table and met Orville Mills (owner of Beacon Bay Marina), and Mr. Mills offered to rent us space to work out of. So we took him up on the offer which made it easier to work on larger boats which could come by water. We then started working out of a small room for a few years then expanded to a larger facility and bought some newer equipment in 2002. We specialize in all aspects of fabricating custom canvas including mooring cover, helm cover, screen enclosure, or any type of custom marine canvas cover or enclosure.We also custom design, fabricate and install glass (isinglass) cockpit enclosures, and screen enclosures, and make boat covers of all types for powerboats and sailboats, for every size boat from dinghy to yacht. We also can custom upholster your cockpit and deck cushions, saloon cushions and backs, v-berth and stateroom cushions and mattresses, sofas, chairs, or anything else that needs upholstering. 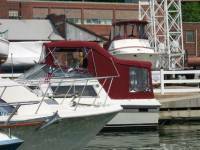 You can see many examples of our work on the Finger Lakes, and surrounding area. We also do Shrinkwrap for winter storage of your boat. We are able to provide the most value and innovation per your dollar spent.